Everyone, meet 26-year-old Gabi, the human manifestation of every tired joke about millennials. 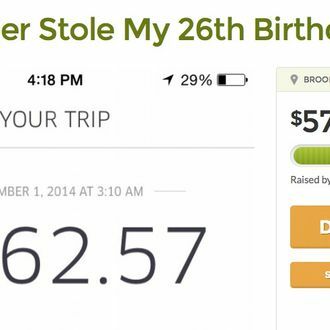 Here is her story, which was first noted by Business Insider: On Saturday morning — her birthday — Gabi woke up to find that the 22-minute Uber ride she’d taken from a Halloween party the night before had cost her $362.57, thanks to holiday surge pricing of nine times the regular rate. Unable to pay, she set up a page on the crowd-funding site GoFundMe. My rent is $450 and I can no longer pay it today due to this completely outrageous charge. I have had little to no luck in disputing this transaction. I waitress at two restaurants and freelance for a City Paper. I worked incredibly hard this week to be able to enjoy my birthday this weekend. This misunderstanding has cost me 80% of the funds I have to my name (embarrassingly so) and I spent a good two hours of my birthday crying over it. Of course, Gabi should have known what she was getting into, since the Uber app clearly warns users when its (frequently outrageous) surge-pricing is in effect. But rather than point that out, people donated a combined $573 to the cause, which means that the birthday girl actually made $210.43 off of her 3 a.m. trip home. Not bad, Gabi, not bad at all.